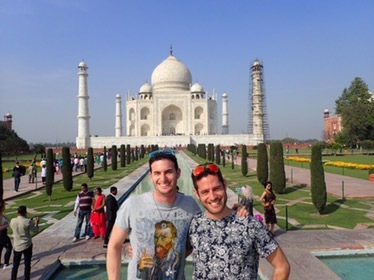 We left the craziness of Delhi to enter the second point in the tourist path known as the “Golden Triangle”, Agra, home to the famous Taj Mahal. It took us ten minutes of walking and deflecting rickshaw drivers to arrive at the Eastern entry to the Taj Mahal. Manicured gardens led us to the gate that keeps the Taj protected from the eyes of the village that surround the complex. As we got closer, the first glimpse of the fantastic building to bring me back to a long forgotten memory of a puzzle I assembled when I was a kid. Maybe the memory was planted in the back of my head calling me to come here. First impressions: the Taj Mahal at its mightiest. Many many impressions were written about this building, none of them can describe the sensation of awe, perfection, and harmony this place inspires. Not even the flocks of tourists could ruin it. The most amazing feature of this monument is scalability: you can appreciate the symmetry and perfect setup of the Taj between the gardens and the river, and between the twin mosques (one fake) at its sides. Engraved walls leading to the entrance. 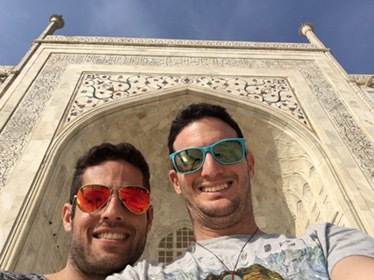 When you get closer you can’t miss the perfect curvature of the domes, the angles of the minarets or the complex Farsi calligraphy on the arches, every single detail thought and calculated. 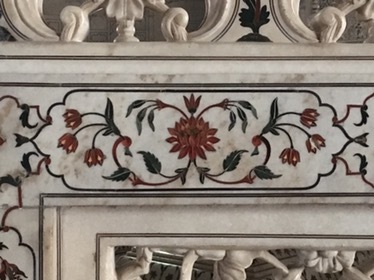 And then you get inside and you find intricated carvings in the perfectly polished marble, including translucent walls. Finally, you can’t miss the semi-precious stone engravings: a flower made of 69 pieces perfectly inserted in the marble. Engraved flower made of 69 semi-precious stones: Sapphires, Jade and more. All the way from the mega large to the tiniest detail this place pays tribute to the details and aesthetics. As an engineer and a german descendant, I can’t help it but fall in love, probably the same way the Maharaja that build this place to honor the memory of his wife felt for her.